ABC MOTORS COMPANY LIMITED – Diesel Service Department is a one-stop-shop that offers Ultimately Dependable maintenance & repair support to ensure that the best possible services are offered to our customers. We have a proud after sales care record as we have a determined commitment to constantly improve our product and customer support. In addition, the company comprises of an experienced labour force with a distinctive and well planned ongoing advanced technical training all year round from an in house technical instructor as well as UD Trucks International trainers to ensure the highest quality of workmanship. Frequent driver’s as well as owner’s training, in accordance to up-to-date technologies, are delivered free of charge to our related customer personnel. 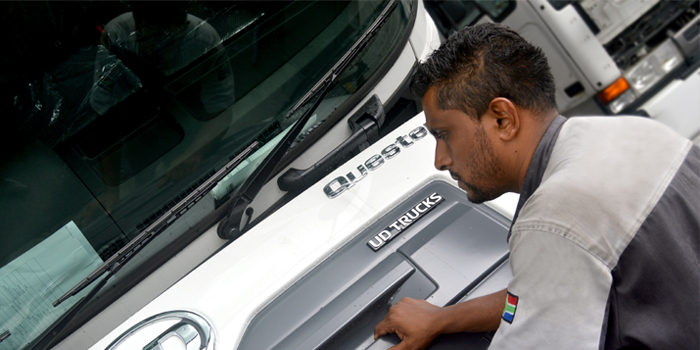 Our staff is here to assist the customers to plan their maintenance schedules, firstly to limit downtime and further to prevent any breakdowns. Systematic history records of each vehicle delivered are kept in our database, which are consulted upon any further interventions. To achieve the lowest lifecycle costs and thus saving money on the long-term basis, the best strategy is to service trucks at an accredited UD Trucks dealer by trained technicians and fitment of only genuine UD Trucks parts. When it comes to product support, ABC MOTORS COMPANY LIMITED – Diesel Service Department is committed to provide an excellent service to our customers, with 24/7 roadside assistance. We also offer remote assistance by phone and by powerful diagnostic tools such as Tech-tool and telematics. We care for your UD vehicle.